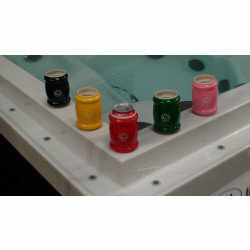 The Grip-O is a bottle holder and beverage can insulator designed for use on watercraft and any other surface such as fibreglass gelcoat, hot tubs, plexiglass, glass or metal. For best results, simply insert beverage can or bottle, and stick on, the eight little suction feet will hold it in place. Do not insert hot drinks. 500ml bottles and normal cans fit perfectly.